It was a warm, slightly damp afternoon in Leigh, New Zealand, when the doors of the Sawmill Café were thrown open to welcome an enthusiastic crowd of local fans and those who had traveled some distance to join The Pipi Pickers in celebrating their first CD at the “As Is, Where Is” CD launch party. The vibe was expectant, yet casual in a New Zealand summer Sunday afternoon kind of way, and the warmth in which greetings were exchanged between band members and the guests that were streaming into the venue hallmarks the seven long years of building a local fan base before finally releasing their album “As Is, Where Is”. Two fantastic sets ensued, including songs from their album and songs from their standard repertoire. The Pipi Pickers invited Micheal Young, from Studio 27A, who produced their album, to come and join them for “Who Knows What Tomorrow May Bring,” Czech fiddler Slávka Franclíková burned up the stage as she and the Pipis belted out “Ralph’s Banjo Special” and songwriter Heather Robin Carrigan chimed in with backing harmonies on “Turn the Page Again” and her original “Southern Buster,” both of which are on the album. A request from the audience resulted in her taking the stage to play her original song “Worth The Wait,” with the Pipi Pickers backing her up. The crowd clearly enjoyed the performance, laughter and applause were plentiful and the venue was packed from beginning to end. 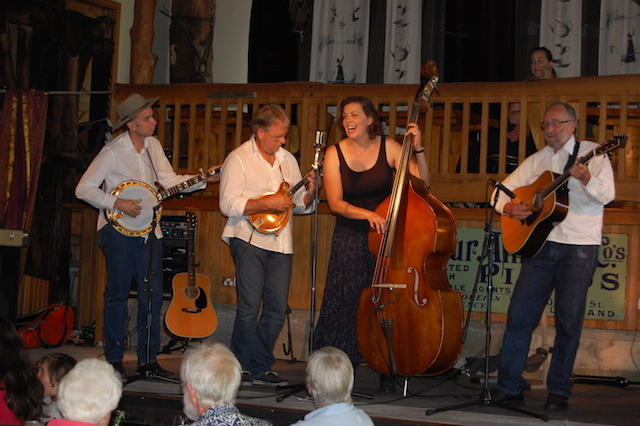 The Pipi Pickers, with Jenine Abarbanel (Lead Vocals, Bass), Nat Torkington (Banjo), Barry Torkington (Guitar) and Garry Bigwood (Mandolin, Guitar, Harmony Vocals), have put in many hours of performing in New Zealand, Australia and the United States, to work up the “gel” that makes their performances a stand out. Jenine Abarbanel, multitasks beautifully, singing lead, keeping the banter flowing, playing great driving bass, all while looking gorgeous! Nat Torkington, in the opinion of many, is one of the finest banjo pickers to come out of New Zealand and it’s his playing that anchors the group’s intensity. Barry Torkington is a great rhythm and flat pick guitarist and it was his passion for Bluegrass from an early age that brought the band into being. Garry Bigwood on mandolin and guitar, lends light and colour to the The Pipi Pickers’ distinctive sound with smooth and melodic licks. The Pipi Picker’s first album “As Is, Where Is” was produced by Micheal Young of Studio 27A and is a collection of some great covers of both traditional and not so traditional songs. It also features an original Pipi Pickers instrumental collaboration, and a song from New Zealand songwriter Heather Robin Carrigan. Pipi Picker fans will also be pleased to know the band has included their version of Gloria Gaynor’s hit “I Will Survive” on the album, which has been a crowd favourite at concerts and festivals internationally. Want a copy of “As Is, Where Is”? Their website – www.pipipickers.com says that digital downloads are available through Bandcamp or you can order a physical copy direct from the band for $15 plus shipping. Micheal Young may be contacted at: studio27A@gmail.com.